This striking mask, representing Tsonokwa (Dzunukwa), the "Wild Woman of the Woods", giantess of the winter dances, with carved and painted details, the broad face with heavy brows, pierced tapered almond-shaped eyes, faceted cheeks, and the traditional projecting open mouth. Painted in black, gray-black graphite pigment, and red. A small tack with remains of hide, and several small holes, indicate former attachments, now missing, such as hair. By an unknown Native Canadian American Bella Bella carver of the late 19th Century. Condition: This mask is in excellent condition for a 100+ year old mask. Provenance: Formerly in the collection of Gertie White, member of a Bella Bella noble family. 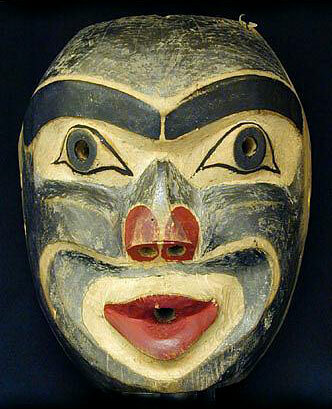 This mask has an oral tradition of having been last used in a 1906 potlatch, and dates to circa 1890-1900.